The global datacenter network consulting and integration services market is likely to exhibit robust growth in the coming years due to the rising complexity in the network design requirements of data centers and the rising need for data centers in a number of industry verticals. The datacenter network consulting and integration services market is likely to benefit from the rising number of end users of data centers, which has brought about versatility and customizability in datacenter network design and is likely to remain a key determinant of the growth potential of the global datacenter network consulting and integration services market in the coming years. The rising complexity of datacenter operations is also likely to benefit the global datacenter network consulting and integration services market in the coming years. The global datacenter network consulting and integration services market was valued at US$2.2 bn in 2017. According to Transparency Market Research, the market is likely to exhibit a strong 7.9% CAGR over the 2017-2022 forecast period and emerge at a valuation of US$3.2 bn. One of the key drivers for the global datacenter network consulting and integration service market is the rising number of verticals adopting data centers in their operation. Data centers have become vital due to the rising use of digital data generation and customer outreach mechanisms, which present better financial prospects to end users. Booming sectors such as IT and telecommunication and BFSI are likely to remain vital contributors to the global datacenter network consulting and integration service market in the coming years due to their rising need for mechanisms that can handle growing volumes of digital data efficiently. The complexity of network design required in advanced operations in economically important sectors such as BFSI is likely to drive the datacenter network consulting and integration service market in the coming years. Of the several types of consulting services offered in the datacenter network consulting and integration service market, network design dominated demand in 2017 and is likely to remain the leading contributor to the global market through the 2017-2022 forecast period. The network design segment of the datacenter network consulting and integration service market was valued at US$581.1 mn in 2017 and is expected to rise to a valuation of US$929.6 mn by 2022. The segment is likely to exhibit a robust 9.9% CAGR through the forecast period on the back of rising demand for advanced network design technology in data centers due to the rising need for customization. Of the key regional segments of the global datacenter network consulting and integration service market, North America is expected to dominate demand in the coming years. The North America market for datacenter network consulting and integration services was valued at US$854.8 mn in 2017 and is likely to rise to US$1,253.5 mn by 2022. The market is expected to exhibit a robust 8% CAGR between 2017 and 2022, enabling steady dominance of the region in the datacenter network consulting and integration service market in the coming years. The global datacenter network consulting and integration services market is dominated by leading players such as Google Inc., Cisco Systems, Microsoft, IBM, Apple, AT&T, NTT Communication Corporation, HP Enterprise, Equinix, and Digital Reality. The global datacenter network consulting and integration services market is likely to remain relevant to economic dynamics in the coming years due to the increasingly important role played by data centers in the development of a number of industries. The report on the global datacenter network consulting and integration services market provides a thorough discussion on the market with the help of detailed assessment of various drivers affecting the growth trajectory of the market, the leading segments of the global datacenter network consulting and integration services market, and the key companies likely to dominate the market in the coming years. Thus, a complete evaluation of the datacenter network consulting and integration services market is provided in the report. 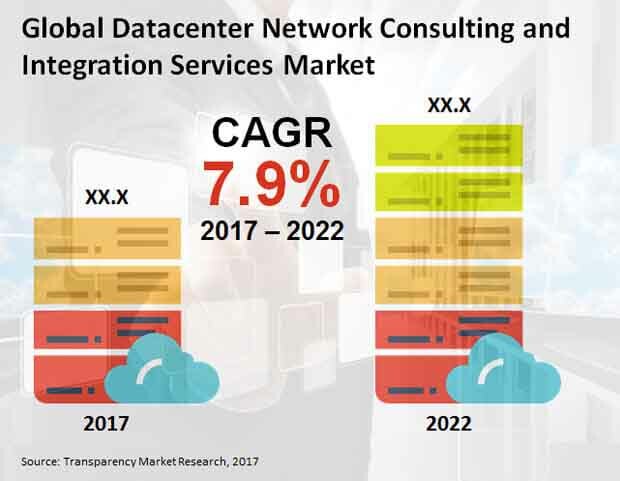 According to Transparency Market Research, the global datacenter network consulting and integration services market was valued at US$2.2 bn in 2017. Exhibiting a robust 7.9% CAGR over the 2017-2022 forecast period, the global datacenter network consulting and integration services market is expected to rise to a valuation of US$3.2 bn by 2022. The report profiles the numerous factors that are likely to have a lasting impact on the growth trajectory of the global datacenter network consulting and integration services market. This helps the report provide readers with a clear picture of the growth dynamics of the global datacenter network consulting and integration services market, allowing them to make informed decisions likely to benefit their enterprise. The key drivers and restraints likely to impact the global datacenter network consulting and integration services market are analyzed in the report, giving readers an idea of the most beneficial facets as well as pitfalls in the market. This detailed analysis of the drivers and restraints of the global datacenter network consulting and integration services market constitutes a key part of the report, as it provides readers with crucial information on how best to expand their presence in the market in the coming years. Network design consulting is likely to remain the dominant consulting service in the global datacenter network consulting and integration services market in the coming years. The crucial importance of network design in modern data centers, which can exhibit a high amount of customization to accommodate different industry verticals, is likely to enable steady growth of the network design segment of the global datacenter network consulting and integration service market in the coming years. The network design segment was valued at US$581.1 mn in 2017, accounting for 26.2% of the market. The segment is likely to exhibit a robust 9.9% CAGR over the 2017-2022 forecast period and is thus likely to rise to a valuation of US$929.6 mn by 2022. Geographically, North America is likely to remain the dominant contributor to the global datacenter network consulting and integration services market due to the widespread proliferation of advanced data center technology in North America and steady growth of numerous key end use verticals. The North America market for datacenter network consulting and integration services was valued at US$854.8 mn in 2017 and is expected to rise to US$1,253.5 mn by 2022, rising at a robust 8% CAGR between 2017 and 2022. Leading players in the global datacenter network consulting and integration service market include Google Inc., IBM, Cisco Systems, NTT Communication Corporation, Apple, Microsoft, Equinix, AT&T, HP Enterprise, and Digital Reality.